Background: Chondrogenic differentiation of human embryonic stem cells (hESCs) has been investigated by maintenance of 3-dimensional cultures in the presence of various exogenous growth factors added during defined stages of culture, or in cocultures with primary chondrocytes, making the cultivation process rather complex. Thus, there is a need for easier and more handy expansion and differentiation protocols. Objective: The present study is aimed to investigate the potential of hESCs for chondrogenic differentiation in simpler culture conditions. Methods: The hESCs were directly cultured for 3 weeks on feeder-free gelatin-coated plates in chondrocyte culture medium without any growth factor supplements after 6-day culture on feeder-free gelatin- coated plate with conditioned medium. Results: Immunocytochemical and gene expression analyses indicated that these human directly differentiated cells (hDDCs), which derived from the hESCs, abundantly expressed Sox9, aggrecan, and procollagen α1(II) mRNAs. 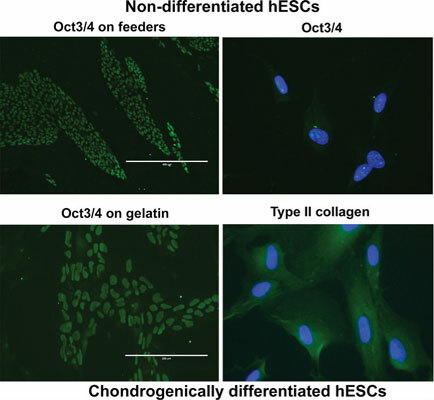 Upon further passaging, the hDDCs behaved similarly to primary chondrocytes, although the aggrecan mRNA expressions were maintained at a relatively constant level throughout passaging. The procollagen α1(II) mRNAs expression was high in the beginning of the hDDC culture, but declined upon further passaging, which is typical for the primary chondrocytes. The hDDCs could be easily expanded in the monolayer culture using chondrocyte culture medium. Differentiation assays showed that the hDDCs could be differentiated towards chondrocytes, but not adipocytes or osteoblasts. Conclusion: Our data suggests that the chondrogenic gene expression could be induced in the directly differentiated hESCs without a need for chondrocyte coculture. In contrast, no osteogenic or adipogenic differentiation was observed. Chondrogenically differentiated cells, differentiation, directly chondrogenesis, gene expression, human embryonic stem cell, monolayer culture.